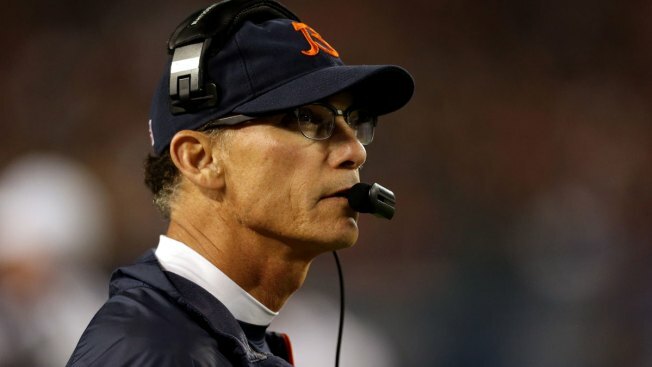 Should the Bears Put Marc Trestman on the Hot Seat? The Chicago Bears came into Sunday’s game hoping to get back to .500 before their Week 9 bye, but things quickly took a turn for the worse as they were blown out by a score of 51-23 by the New England Patriots in Foxboro. With a 3-5 record on the season, the Bears are currently in last place in the NFC North division, and things are only going to get more complicated from here. Out of their bye week, they have to head to Green Bay to take on the Packers at Lambeau Field, and they still have games on the schedule remaining against the Detroit Lions (twice), the Dallas Cowboys (arguably the best team in the NFL at the moment) and the New Orleans Saints. With losses and frustration mounting, some Bears fans are beginning to call for heads to roll at Halas Hall. Marc Trestman’s name is obviously the first to come up, with the offense failing to score 20 or more points four times this season, but Mel Tucker and Joe Decamillis haven’t escaped criticism either. Tucker’s defense showed some great punch against the Atlanta Falcons in Week 6, but they’ve been embarrassed in back-to-back games by the Dolphins and Patriots, and they seem to be regressing rather than progressing as the season goes on. With tensions running high both in the locker room and amongst the fan base, there is a question that needs to be asked as the team heads into the bye week: Should Marc Trestman be on the hot seat? In fairness to Trestman, coaches don’t usually get fired after two seasons, and the Bears are a team that historically tends to give their coaches all sorts of chances to succeed. This is the first big run of adversity that the Bears have faced in Trestman’s tenure as they have dropped four of their last five games, but they’ve also faced a couple of really tough opponents in those games. The Carolina Panthers nearly beat the Seattle Seahawks on Sunday (and also have an aggressive defense that is tough to score against), and the Dolphins are running neck-and-neck with the Patriots for the top spot in the AFC East. Even with that being the case though, questions about Trestman’s job security are valid. The team is clearly not making the progress in his second year that they should be making, and if anything they are playing worse, not better, as the season goes on. The offense looks disjointed, the game plan has raised some eye brows because of its ineffectiveness, and the locker room sniping doesn’t exactly scream peace and harmony for a coach that preaches those concepts often. At the end of the day, Trestman is likely safe unless things really go off the rails here. If the Bears can finish 7-9 or better, Phil Emery is a heck of a lot more likely to can Aaron Kromer and Mel Tucker than he is to sack the entire coaching staff and start over from scratch. The problem of course is that the Bears are looking at a situation where their core group of players is getting up in age, and while there are youngsters like Kyle Fuller and Alshon Jeffery to build around, veterans like Jay Cutler and Jared Allen are eating up a lot of salary cap room that could be used in a rebuild of the team. It is that last argument that is the most compelling for Trestman to stay the course. This team has a limited window left to contend in before some serious changes need to be made, so changing coaches at this point in the game would be the wrong move. Firing guys like Tucker and Kromer would certainly suffice if the Bears continue to fall down the standings, but letting Trestman go after two years would be a premature move.